Chuuk Atoll, (also Known as Truk) in the Caroline Islands is the final resting place for more than 100 ships, planes and submarines - the legacy of a fierce World War II battle between the Imperial Japanese Fleet and Allied carrier planes. The lagoon has been declared an underwater museum. In more than 50 years, the warm, tropical waters and prolific marine life has transformed the wrecks into artificial reefs and beautiful coral gardens. Nowhere else in the world are there so many wrecks in close proximity, situated in shallow clear water. 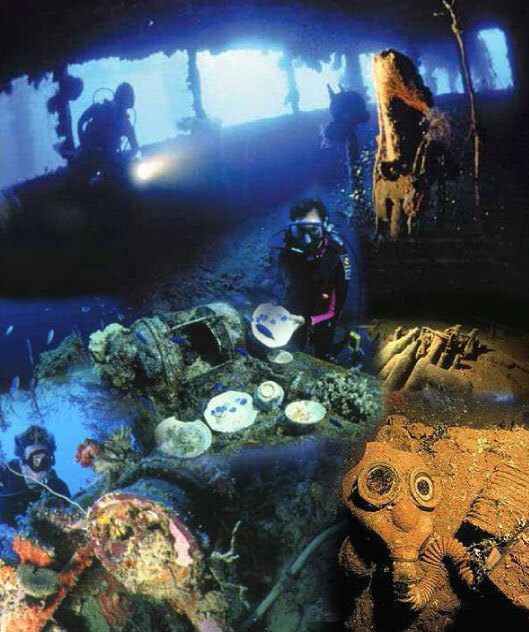 Many of the wrecks are visible while snorkelling and there are many on-shore wartime locations to visit. There is wreck diving in shallow waters from 15-40 meters, no need to go deep! Fujikawa Maru: A 132m (436 feet) armed aircraft ferry with six holds, four of which are open. 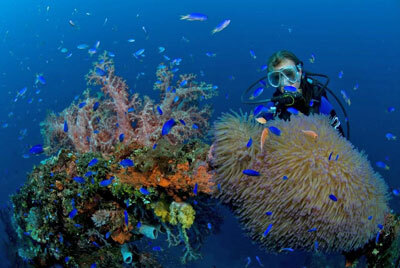 One of the most fascinating dives in Truk Lagoon. There are incomplete zero fighters in the number 2 hold large deck guns on the bow and stern. Depth to deck is only 15 meters. Submarine 1-169: Lying on its port side in about 38 meters of water, it is 104.7m (343½ feet) long. During the April air raid the submarine submerged to avoid damage. Unfortunately the valves were not closed during this manoeuvre and the sub sunk. Shinkoku Maru: One of the most colourful and spectacular dives. This vessel is well preserved. Small guns are mounted fore and aft. The ship is upright in about 38 metres of water, 12 metres to the top of the bridge and 20 meters to the main deck. Susuki Maru: Destroyer, subchaser lying on its port side. Bow in 3 meters of water, stern with propellers in 15 meters. Gas masks and depth charges still scattered on the deck. Rio De Janeiro Maru: A 141 m (463 feet) cargo vessel converted from a luxury passenger liner. The holds contain supplies ranging from beer bottles to guns and other military supplies. The ship is lying on its starboard side with it's deck only 15 meters from the surface. Conditions Apply. Rates subject to change without notice. All prices based on bank transfers, cash or cheque. Credit cards are acceptable but credit card fees apply.